MOTIVATED SELLER!! 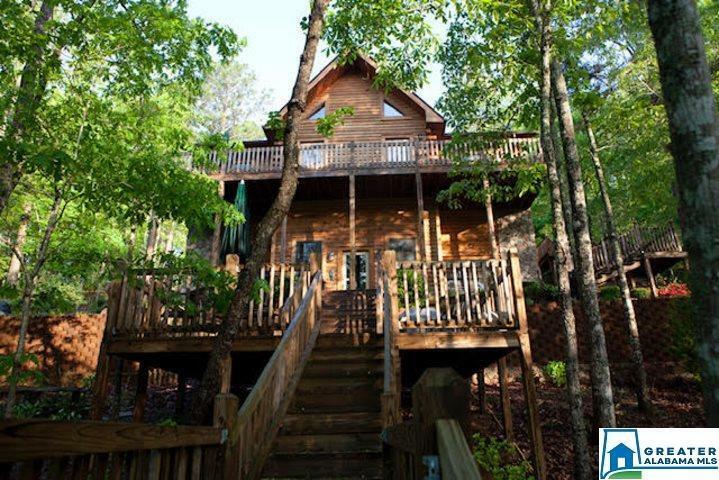 This is a well maintained rustic log home that offers 4 bedrooms and 3 full bathrooms with the master on the main level with access to a deck over looking the lake. The open floor plan offers a nice kitchen, great room and spacious loft for your family and friends to enjoy the lake life. The kitchen has granite counter tops and an eat in bar. The great room has vaulted pine ceilings and a dining area with access to a large deck that over looks the water. There is a second bedroom and full bath on the main level for your guests. The terrace level has a small kitchen, family room, 2 bedrooms and a full bathroom. Great area for your kids. You are just a few steps from the patio to 106 feet of shoreline with year round water and a covered floating dock with boat lift and 2 jet ski ports. This home is located in a nice private cove minutes from open water and the marinas. There is a large garage with plenty of space for your lake toys and workshop. Driving Directions: From Wedowee Travel Hwy 431 North, Turn Left On Co. Rd. 121, Left On Co. Rd. 321 Cross Over Co. Rd. 256 Onto Laska Drive, Turn Left On Luther Drive. House Will Be On The Left.